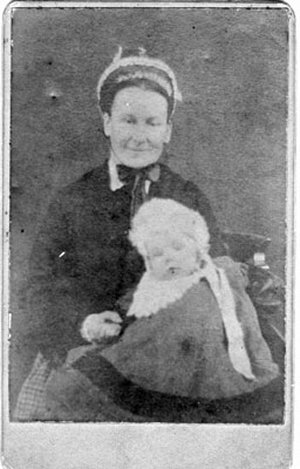 "....Emma Matilda BROOKS (nee DOXEY), wife of Thomas and Florence SLACK's maternal grandmother, holding daughter Lydia (c 8 Jun 1877). Emma Matilda DOXEY married Thomas BROOKS (see photo X148), a lead miner, on 17 Sep 1863. They had eight children. In 1881 they were living in Main Street, Middleton. "